Just before Christmas I saw my first real life QR (Quick Response) code, in the government liquor store in Chilliwack. It was on an ad for wine and I would have checked it out if my hands weren’t full and if the store wasn’t packed with last minute spirit shoppers. I have to say, I was genuinely excited. QR codes have been around for a while first in the form of barcodes and then more recently in their current form. They were created initially to aid in automobile production by Denso-Wave a subsidiary of Toyota. Wikipedia has a thorough history if you want the full story. QR codes are not quite the next best thing to sliced bread but they do hold a lot of potential. The most obvious uses are in the marketing arena. Because they are small, one colour, easily reproducible, kinda cool looking and can hold tons of data, the possibilities for increasing brand awareness and for tracking ROI are huge. For example add a QR code to a business card and you can keep customers up to date on sales and specials. The code could link to your website or to a specialized website that is optimized for viewing on smart phones. The codes can hold URL’s, text, SMS, email addresses, phone numbers, Vcards, pretty much any type of content you can view or hear on your phone can be embedded into a QR code. Because the codes are easily reproducible, as in a one colour print, the codes themselves can be placed on any item that can be printed on. So, in addition to all kinds of paper products, tee-shirts, buttons, pens, mugs, the list goes on, can host a code. If I was still in promotions I would be in heaven. Hey, indie bands, add to your posters and flyers – embed a link to an MP3 of your best song or better yet to a video of your best chops. How cool is that? The gaming industry and especially the place based, check-in (foursquare, dehood, gowilla, scvnger, etc) type games will probably, if not already integrate QR codes into the play. I signed up for http://www.stickybits.com/ just to see how it works (it’s kinda lonely there right now due to Chilliwack thing perhaps). The addition of the codes can potentially add a layer of play and trackability to game sponsors and hosts. Here’s there video, that explains the game much better than I can. I’m not in marketing and promotion per se any longer so I have been trying to think outside of that box and focus on ways to leverage this newish tech for social good, community engagement and other ways that will benefit human kind. The uses in education seem to pop up front and centre. 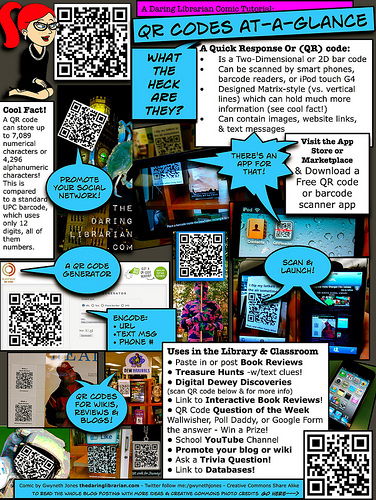 What better way to make learning fun than to use QR codes for digital scavenger hunts. I can’t wait until I can pick up a book and scan the QR code on the back to see an interview with the author. Or better yet find a QR code on the inside that provides me with additional and up to date information. Ditto for newspapers and magazines. I would be more likely to read a hard copy newspaper or magazine if it had scanable links to additional video content. I also can’t wait until the tourism folks get on board with this. Trail markers with QR codes to maps sure would be nice as would video or at least audio to go along with walking tours of historic areas. Bonus points if there is a scavenger hunt with some kind of prize potential. What a great way to get folks out in their home communities. I think, overall, that once the novelty wears off the real power of the QR code will be in information sharing. I remember writing a blog post years, and I mean years ago, where I waxed poetic about envisioning a day when I would be able to go to a grocery store and be able to immediately and easily access information about all the products I was thinking of purchasing. I imagined being able to get not just nutritional value and calorie count, but cost per serving, links to recipe ideas, price comparisons, the whole nine yards. I think that day has finally arrived. 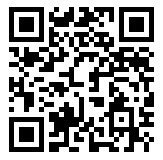 I used http://www.mobile-barcodes.com/ to create this QR code and I’m using the i-nigma app for iPhones to read codes. For more info and examples of the bling – QR code connection check out The Daring Librarian‘s awesome blog. WOW! Thanks for the kind words & shout outs! Next Next post: Do you have a personal cyberinfrastructure?